Most of the rural women are not well educated. The goal of the project is to teach Basic English, Personal Hygiene, Basic Calculations, Basic Computer skills, Knitting and Stitching and other life skills to gain the ability to analyze their own situation and use their knowledge to make changes when necessary. 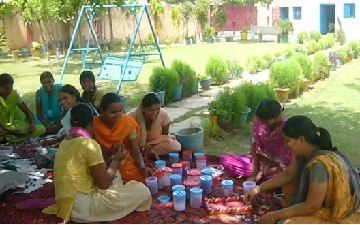 Volunteers have the unique chance to observe the process of how hand made jewelry, plastic and leather bags are produced, stitch and tailored, skills that will later help these women in their quest to be financially independent.